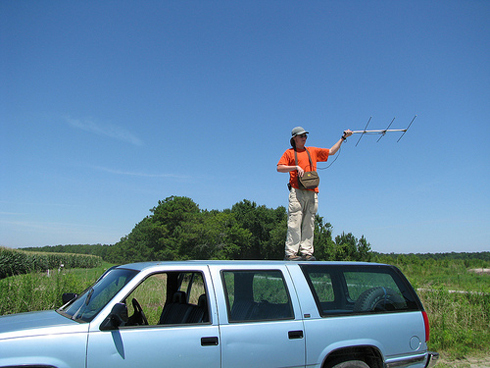 Thomas Esson of Wells, Maine, a major in wildlife science monitored the movements of Red Wolves along US-Route 64 in North Carolina. BLACKSBURG, Va., Aug. 24, 2009 – Thirteen Virginia Tech students concluded their 10-week Summer Undergraduate Research Fellowship (SURF) on Aug. 6 by presenting results on projects that addressed such topics as improving nutrition for persons living with HIV/AIDS in Kenya, gender differences in arterial destiffening with weight loss, and the home range of red wolves in North Carolina. The Fralin Life Science Institute at Virginia Tech offers the fellowships to rising Virginia Tech sophomores, juniors, and seniors with a grade point average of 3.0 or greater (on a 4.0 scale) who wish to pursue life sciences research full-time during the summer, said SURF program coordinator Brenda Davy, associate professor in human nutrition, foods, and exercise in the College of Agriculture and Life Sciences. "Applicants must submit a research proposal for their experience and provide a letter of support from a faculty member who is willing to serve as their mentor," Davy said. David Jiang, a senior from Fairfax, Va., who is assessing "Activity of Aedes aegypti mosquito Transposon, Pogo18" with Jake Tu professor of biochemistry and member of the Vector-borne Disease Research Group (A. aegypti can carry dengue fever, yellow fever, and other diseases. Pogo 18 is a DNA binding region); and Reeder Robinson, a junior from Virginia Beach, Va., studying "Purification and Characterization of TcC-K1" with Pablo Sobrado, assistant professor of biochemistry. TcCK1 (Trypanosoma cruzi Casein kinase 1) is an enzyme involved in regulating growth and development (by phosphorylating other proteins). It is important in the development of the parasite Trypanosoma cruzi, the causative agent of Chagas' Disease. Michael Shlossman, a senior from Lorton, Va., a double major in biochemistry and biological sciences, studied "Phosphoinositide Binding Properties of the Avirulence h5, a Protein Effector that Mediates Phytophthora sojae Invasion to Soybean Plants," with mentor Daniel Capelluto, assistant professor of biological sciences in the College of Science. Phytophthora sojae causes severe damage in soybean crops and results in $1–2 million in annual losses for commercial farmers in the United States. Kaitlyn Childs, a senior from Manassas, Va., studying "Functional Studies of Alphaviruses Non-structural Proteins in Xenopus laevis (the African clawed frog)" with Carla Finkelstein, assistant professor of biological sciences (There are many alphaviruses infecting many animals, including humans. They are transmitted between species by mosquitoes.). Elizabeth Ehrlich, a senior from Bridgewater, N.J., a double major in biological sciences and psychology, studied "Gender Differences in Arterial Destiffening with Weight Loss" with Kevin Davy, associate professor of human nutrition, foods, and exercise in the College of Agriculture and Life Sciences. Christopher Mayo, a junior from Virginia Beach, Va., a major in biological systems engineering in the College of Agriculture and Life Sciences, studied "Engineering Cellulose Utilization by the Bio-butanol Producer Clostridium acetobutylicum" with Ryan Senger, biological systems engineering assistant professor. C. acetobutylicum is a commercial bacterium that can be used to produce acetone, butanol, and ethanol from starch. Rachel Cornett, a senior from Clarksburg, W.V., human nutrition, foods and exercise major researched whether "Participation in a Weight Loss Maintenance Intervention Emphasizing Daily Self-Monitoring Attenuates Holiday Weight Gain" with Brenda Davy. Cornett will also present her data at the Obesity Society annual meeting in Washington D.C., Oct. 24-28. Jennifer Lamb, a senior from Broomfield, Colo., a double major in political science in the College of Liberal Arts and Human Sciences and agriculture and applied economics in the College of Agriculture and Life Sciences, worked on "Value-Added Soya Processing for Improved Nutrition in Support Groups for Persons Living with HIV/AIDS in Kakamega, Kenya." with Keith Moore, program director of education, training and technology transfer in the Office of International Research, Education, and Development and associate director of the Sustainable Agriculture and Natural Resource Management Collaborative Research Support Program (SANREM CRSP). And Thomas Esson, a junior from Wells, Maine, who is majoring in wildlife science in the College of Natural Resources, monitored the " Home Range and Movement Patterns of Red Wolves Along US Route 64, North Carolina" with Marcella Kelly, associate professor in fisheries and wildlife science. The Fralin Life Science Institute provides leadership in the life sciences through the support of faculty and student research and outreach. An interdisciplinary research institute, Fralin brings scientists from different disciplines together under one umbrella to solve some of biology's more complex challenges. Fralin is continuing its legacy of leadership in the development and support of scientific minds from pre-college through undergraduate and graduate education to collegiate faculty, as well as supporting the creation of successful scientific teams throughout the university.